The Cathedral and the Bazaar: Musings on Linux and Open Source by an Accidental Revolutionary (abbreviated CatB) is an essay, and later a book, by Eric S. Raymond on software engineering methods, based on his observations of the Linux kernel development process and his experiences managing an open source project, fetchmail. It examines the struggle between top-down and bottom-up design. The essay was first presented by the author at the Linux Kongress on May 27, 1997 in Würzburg (Germany) and was published as part of the book in 1999. The illustration on the cover of the book is a 1913 painting by Liubov Popova titled Composition with Figures and belongs to the collection of the State Tretyakov Gallery. The book was released under the Open Publication License v2.0 around 1999. 1 "The Cathedral and the Bazaar"
The Cathedral model, in which source code is available with each software release, but code developed between releases is restricted to an exclusive group of software developers. GNU Emacs and GCC were presented as examples. The Bazaar model, in which the code is developed over the Internet in view of the public. Raymond credits Linus Torvalds, leader of the Linux kernel project, as the inventor of this process. Raymond also provides anecdotal accounts of his own implementation of this model for the Fetchmail project. The essay's central thesis is Raymond's proposition that "given enough eyeballs, all bugs are shallow" (which he terms Linus's Law): the more widely available the source code is for public testing, scrutiny, and experimentation, the more rapidly all forms of bugs will be discovered. In contrast, Raymond claims that an inordinate amount of time and energy must be spent hunting for bugs in the Cathedral model, since the working version of the code is available only to a few developers. In 1998, the essay helped the final push for Netscape Communications Corporation to release the source code for Netscape Communicator and start the Mozilla project; it was cited by Frank Hecker and other employees as an outside independent validation of his arguments. Netscape's public recognition of this influence brought Raymond renown in hacker culture. When O'Reilly Media published the book in 1999, it became one of the first (if not the first) complete and commercially distributed book published under the Open Publication License. Marshall Poe, in his essay "The Hive", likens Wikipedia to the Bazaar model that Raymond defines. Jimmy Wales himself was in fact inspired by the work (as well as arguments put forward in works prior to the Internet age, such as Friedrich Hayek's article "The Use of Knowledge in Society"), arguing that "It opened my eyes to the possibility of mass collaboration". In 1999 Nikolai Bezroukov published two cited critical essays on Eric Raymond's views on open source software, the second one called "A second look at The Cathedral and the Bazaar". They produced a sharp response from Eric Raymond. ^ "Colophon". The Cathedral & the Bazaar. O'Reily Media. Retrieved 20 December 2011. ^ Raymond, Eric Steven. "The Cathedral and the Bazaar". Retrieved 18 April 2012. ^ "Epilog: Netscape Embraces the Bazaar". ^ Jim Hamerly and Tom Paquin with Susan Walton (January 1999). "Freeing the Source: The Story of Mozilla". Open Sources: Voices from the Open Source Revolution (1st ed.). ISBN 1-56592-582-3. Frank had done his homework, citing Eric Raymond's paper, "The Cathedral and the Bazaar," and talking to people in departments throughout the organization--from engineering to marketing to management. ^ Sam Williams (30 November 2011). Free as in Freedom [Paperback]: Richard Stallman's Crusade for Free Software. "O'Reilly Media, Inc.". p. 161. ISBN 978-1-4493-2464-3. When Netscape CEO Jim Barksdale cited Raymond's 'Cathedral and the Bazaar' essay as a major influence upon the company's decision, the company instantly elevated Raymond to the level of hacker celebrity. Determined not to squander the opportunity, Raymond traveled west to deliver interviews, advise Netscape executives, and take part in the eventual party celebrating the publication of Netscape Navigator's source code. ^ Poe, Marshall (September 2006). "The Hive". The Atlantic. Retrieved 2012-07-05. ^ Schiff, Stacy. "Annals of Information". The New Yorker. Retrieved 4 July 2014. ^ Karl Eugen Kurbel (23 June 2008). The Making of Information Systems: Software Engineering and Management in a Globalized World. Springer. pp. 222–. ISBN 978-3-540-79260-4. Retrieved 15 October 2012. ^ Bezroukov, Open source software development as a special type of academic research: Critique of vulgar Raymondism" Accessed 23 September 2010. ^ Bezroukov, A second look at The Cathedral and the Bazaar Accessed 23 September 2010. ^ Jan Bergstra; Mark Burgess (19 December 2007). Handbook of Network and System Administration. Elsevier. pp. 202–. ISBN 978-0-444-52198-9. Retrieved 15 October 2012. ^ Eric S. Raymond,"Response to Nikolai Bezroukov"
Raymond, Eric S. (1999). 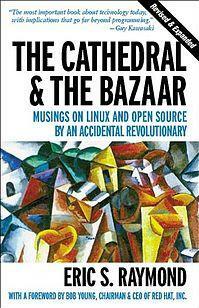 The Cathedral and the Bazaar: Musings on Linux and Open Source by an Accidental Revolutionary. O'Reilly Media. ISBN 1-56592-724-9. Roberts, Russ (January 19, 2009). "Eric Raymond on Hacking, Open Source, and The Cathedral and the Bazaar". EconTalk. Library of Economics and Liberty. This page was last edited on 6 March 2019, at 15:57 (UTC).